I was going to write about another value wine I bought but I’m kind of pooped out so I’ll just update on Snow and Charming and start fresh tomorrow. Turns out that they bark. Well, at least Snow barks. They both had their noses resting on the ledge of our bay window and she started barking. It’s a deep, big dog bark and she did it several times before I gently put my fingers around her snout. I can’t say ‘no’ because she can’t hear me so I improvised. There was a neighbor boy walking on the opposite side of our street at the same time. We took them to the vet yesterday and she said they might be able to see shadows peripherally. It seems a stretch that Snow could see from that far away but I have no other explanation. About 25 minutes later, she did it again. I’d been waiting for a man to look at the cracked pipe of our sump pump so I thought “This is great. Maybe she’s introducing him.” No such luck. There was absolutely no reason I could come up with that she was barking. Then, I caught them on the couch today…four times for Charming and three times for Snow. Admittedly, it was absolutely adorable. Snow, in particular, looked like a little fawn all curled up on one end. But, I had to be the bad guy and coax them down each time. Easier to break a new habit than an old one. Charming has a good nose on him. My husband hid bits of bread he’d made around our living room…under stuff, behind stuff, inside his raw hide bone. He found all the pieces. So, I want to enroll him in a K-9 sniff class. They both should because they’ll tend to bore easier than dogs with all their senses. Now my husband thinks we’re going to be rich with this brilliant, truffle-hunting dog. I’ve had to talk him down from that dream but, hey, it’s one sense he’s developed exceptionally well, it appears…our dog, I mean. 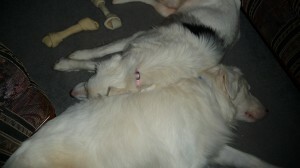 The pictures attached to this blog show how sweet they can be together but don’t let it fool you. Snow is nearly perfect but Charming is a typical inquisitive, trouble-making boy. He stole my socks today, found a paper bag that bread had been in and tried to open the glass fireplace doors. What a mess that could’ve made!